Being an observant Jew at a secular university can seem challenging and limiting, but it doesn’t have to be: Your connection with an OU-JLIC Torah Educator will make key aspects of Jewish life, such as tefillah, kashrut, Shabbat, and chagim easier to observe and more meaningful. At OU-JLIC you will find opportunities to learn Torah, get answers to your Jewish questions, be hosted and supported, and become a more mature person while attending college. If you are looking for a Jewish community on campus, OU-JLIC can be your place to hang out with friends and meet new people. OU-JLIC Torah Educators offer weekly shiurim and classes, and bring guest speakers and events to campus. Students grace their Shabbat tables as regular guests, interact with them in informal settings, such as the cafeteria, and learn with them b’chavruta. Plus, they’re great people to know for plenty of mundane reasons such as if you get sick or need a study break before your finals. 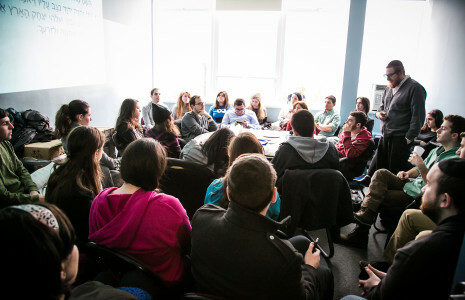 OU-JLIC Torah Educators are considered full members of the Hillel staff, and they interact with many students both Orthodox and non-Orthodox. Because OU-JLIC Torah Educators care about each student, students are comfortable confiding in them and seeking advice for serious issues, whether of a halachic, personal, or intellectual nature. Current or incoming college student not yet connected with OU-JLIC? See your school listed and want to get connected? Let us know here, and an educator will be sure to reach out.